Le foie gras d'Alsace au naturel, la cerise Burlat - apparently the black pepper encased in the foie gras torchon have been cooked. Very, very smooth texture here. There's a thin layer of red wine gelée, topped with Burlat cherry halves as well as some cherry chutney. Yum. Le homard bleu, la pastèque - very, very pretty and also very refreshing for the summer. The bottom of this "pie" was a layer of watermelon, with diced homard bleu, egg yolk emulsion, avocado and green apple, and topped with lobster gelée, lobster carpaccio, and a little bit of lemon mousse on the side. My favorite dish of the evening. La langoustine royale, le Kristal caviar - the only dish I've had before. The langoustine à la plancha was delish, as was the caviar. The watercress coulis came with girolles, mousseron de prés (Scotch bonnets), and lemon confit. Pretty delicious. I still don't get the tiny ravioli. Le Saint Pierre de Bretagne, coques et palourdes - John Dory's not one of my favorite types of fish, but this roasted fillet was better than most. Came with cockles, clams, artichokes, pine nuts, tomato quenelle, and a melange of vegetables. Le pigeon fermier - of course I would choose pigeon over wagyu... and this was done very, very nicely. The breast was resting on a bed of sweet-tasting barley couscous with Moroccan spices, with chickpeas and fava beans on the side. A swoosh of tomato purée and a small quenelle of very sweet caramelized onions adorn the rim. When I was asked how I wanted my pigeon, my reply was "rosé". And it was most certainly pink, and very tender. Very, very good. The leg was also incredibly delicious. Sélection de fromages affinés - I was trying to be good and only picked a few... and didn't follow a couple of the other guys into the cheese cellar. Croix Cathare - nice and creamy with some acidity. Coulommiers - very ripe and a little stinky with ammonia. Colombier - pretty acidic, thick and creamy. Murat de Montagne - salty with a bit of ammonia, and a little stinky. Comté, 4 years - ah... what else can we say about this crowd favorite? Yum. 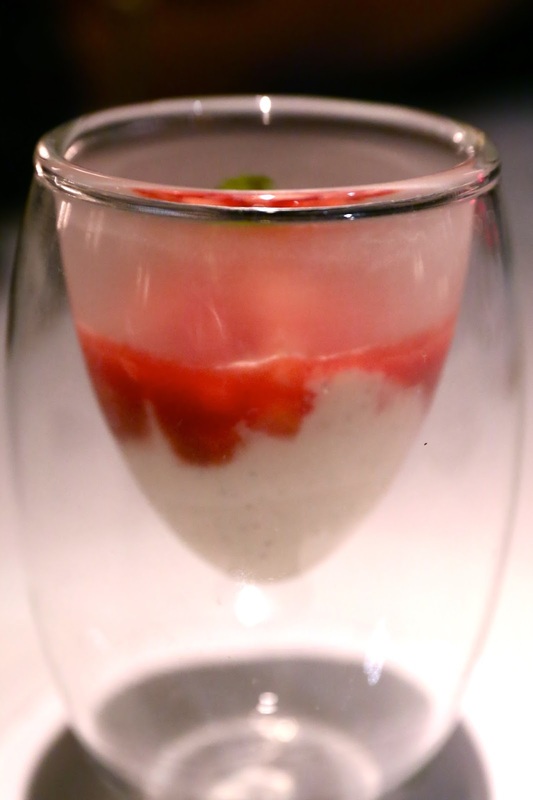 Une soupe de fraise - really delicious, with seasonal Gariguette strawberries with beautiful Tahitian vanilla cream. Le chocolat Guanaja - bitter chocolate soufflé with liquid center, along with a generous serving of hazelnuts. I was too full to really enjoy the mignardises... and so were the others. So we had them packed so the kiddies at home can enjoy them. But I did nibble on a mini madeleine. I noticed that the restaurant had raised their corkage from HKD 500 to HKD 750. This kinda hurt for the bunch of us, as wine is central to our gatherings. So we decided that each couple will bring 1 bottle instead of 2, since that amount of wine would still keep us pretty happy. I did bring an extra bottle... just in case. 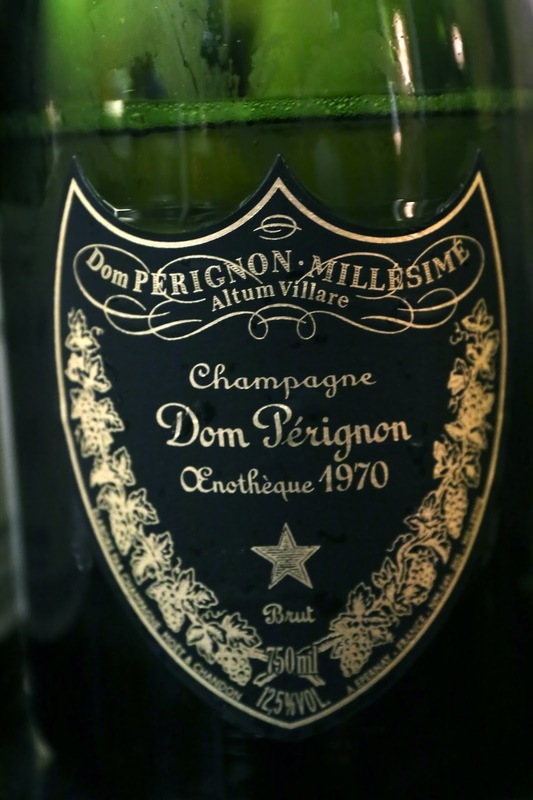 1970 Dom Pérignon Œnothèque, dégorgée à Janvier 2014 - sooooo beautiful. Very fragrant and nutty nose with coffee and toast. Very smooth on the palate, with mild acidity here. Wow! Loved this. 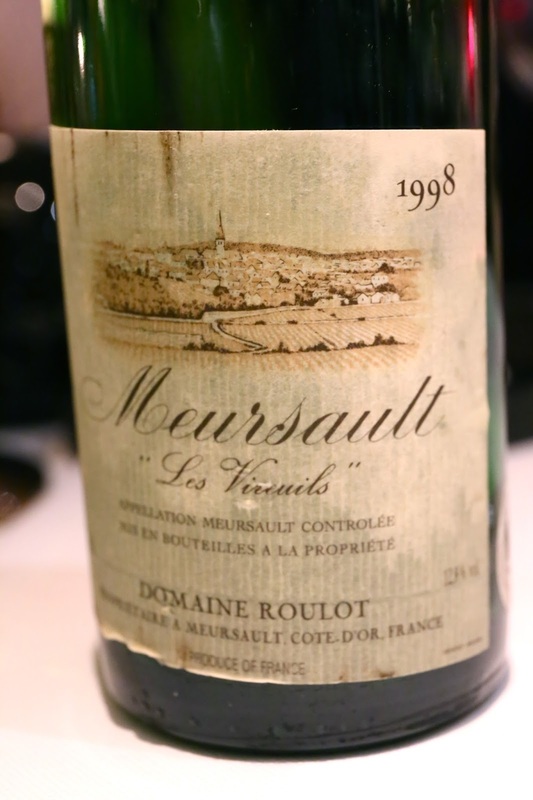 1998 Roulot Meursault Les Vireuils - a little toasty on the nose, very nice and elegant, and took a while to open up. Very round on the palate. 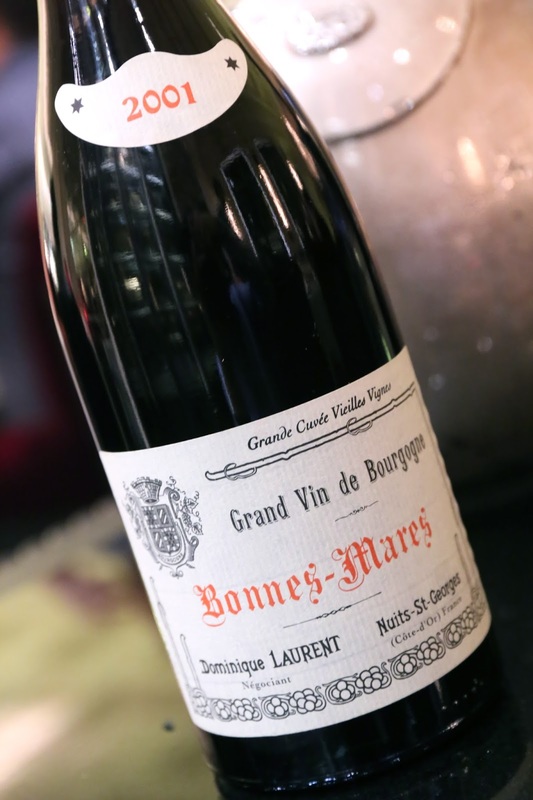 2001 Dominique Laurent Bonnes-Mares - very nice and fragrant nose, fruity, with some dried herbs. A little leather and eucalyptus here. 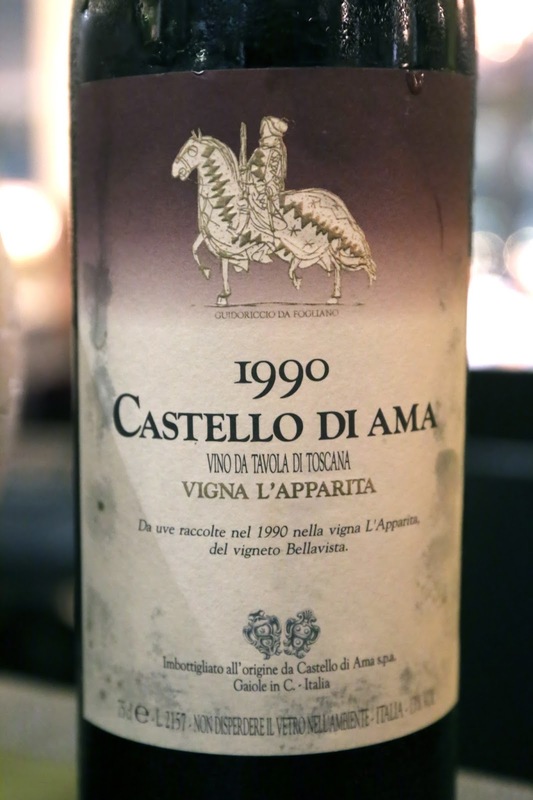 1990 Castello di Ama Vigna L'Apparita - decanted about half an hour prior to serving. Some medicinal notes here, with mint, dried herbs, some sweet fruit, but definitely a little green and vegetal. Tannins are still here after 25 years. 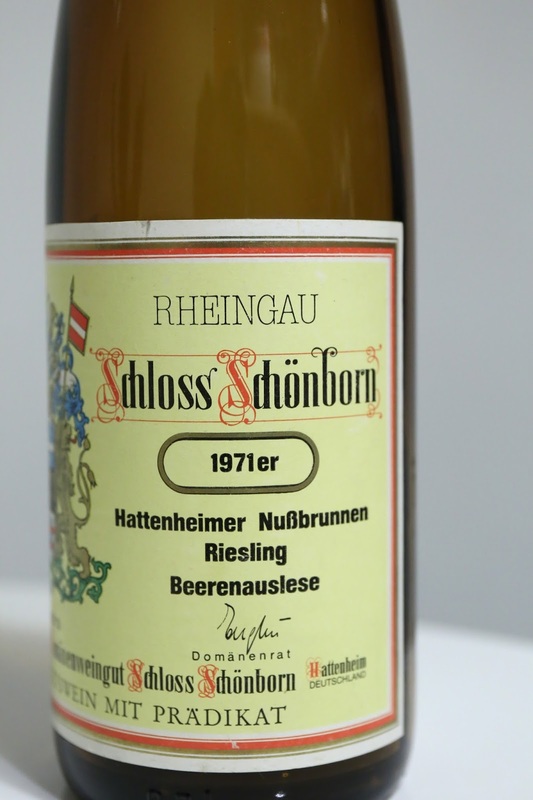 1971 Schloss Schönborn Hattenheimer Nußbrunnen Riesling Beerenauslese - really grapey, nutty, sweet, with orange marmalade. Yum. An evening with good food and good wine, but unfortunately one that ended with us leaving on a sour note. Before we arrived, I notified the restaurant about one of our friend's condition, and that she would be ordering à la carte instead of taking the menu. During the ordering process, she was very specific with Sebastien and truth be told, he was very helpful and accommodating - befitting a restaurant that not long ago held three Michelin stars. But there was a particular ingredient that she did not and could not have, and about this she was very specific and insistent. She checked with the staff three times about this. When the dish arrived, she took a bite, and then saw the ingredient in front of her. A couple of us looked, smelled, and suspected that the banned ingredient was in her dish. We asked again, and to my friend's horror we were told that the kitchen had indeed used the banned ingredient. This was just unacceptable. Somewhere along the line, communication broke down between the front of house and the kitchen. Either the kitchen wasn't told, or the kitchen forgot or didn't care. After being so specific and careful, an unwanted ingredient was still served to a guest. We might have expected this from a lesser establishment - because we knew that the establishment's staff wouldn't care - in which case we would not have patronized it. But this was (my once beloved) Caprice. A restaurant that once held three Michelin stars - and still holds two. In the Four Seasons Hong Kong. When we come to establishments like this, we expect better. Caprice used to have impeccable service - far better than any other restaurant in town - but it is no longer the case. How far it has fallen! Yes, Sebastien was apologetic, and my unhappy friends had a few words with the hotel manager. The restaurant ended up not charging the unhappy couple for their meal, and I think they may have waived corkage for a couple of bottles. So they made an effort to make amends, but unfortunately the mood for the evening had already been soured. And what a shame! Some of my friends (who were frequent guests) haven't been back since Chef Fabrice came onboard, and were really looking forward to returning to Caprice. Now they've lost a few customers for good. The photography on this post is excellent.